1 Tuner + 1 or more non-Tuner Winged Beast-Type monsters. When this card is destroyed by battle and sent to the Graveyard, you can Special Summon 1 Level 4 or lower Winged Beast-Type monster from your.. When a monster is Special Summoned from your Graveyard, you can Special Summon this card from your hand. 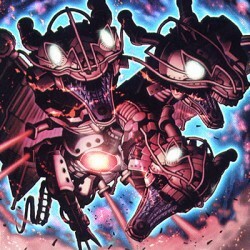 If this card is sent to the Graveyard as a Synchro Material Monster, you can Special Summon 2 ".. When this card you control is destroyed by your opponent's card (either by battle or by card effect) and sent to your Graveyard, you can select 1 "Stardust Dragon" in your Graveyard and Special Summon..
During either player's turn, you can send this card from your hand to the Graveyard to select 1 face-up Tuner monster you control. This turn, that monster cannot be destroyed by battle, and you take n..
You can remove from play this card from the Graveyard to select 1 face-up "Blackwing" monster you control. If that monster attacks this turn, you take no Battle Damage from that battle, it is not dest.. If 2 or more face-up "Blackwing" monsters you control are destroyed in the same turn, you can Special Summon this card from your hand. If this card is sent to the Graveyard as a Synchro Material Monst..
During your opponent's Battle Phase, if you control no monsters, you can remove from play this card from the Graveyard to select 1 Synchro Monster in your Graveyard, and Special Summon it. It is remov.. If this card battles a Level 4 or lower monster, you can return that monster to the hand after damage calculation.l.. When a monster you control is destroyed by battle and sent to your Graveyard, you can Special Summon this card from your hand. Once per turn, when this Defense Position card on the field is changed to.. When this card is Normal Summoned, you can select 1 face-up monster you control, except this card. Special Summon 1 "Nordic" monster from your hand with a Level less than or equal to the selected mons..
During the turn this card is Normal Summoned, you can Normal Summon 1 "Nordic" monster in addition to your Normal Summon or Set. (You can only gain this effect once per turn.) When this face-up card o.. When this card is Normal Summoned, if your opponent controls a monster and you control no other cards, you can remove from play 2 "Nordic" monsters from your hand to Special Summon 2 "Einherjar Tokens.. If you control a face-up "Six Samurai" monster other than "Legendary Six Samurai Kizan", you can Special Summon this card from your hand. While you control 2 or more other face-up "Six Samurai" monste..
During either players turn, if you control another face-up "Six Samurai" monster with a different name, you can remove from play 2 "Six Samurai" monsters from your Graveyard to select 1 face-up monste.. When this card is Normal Summoned, you can Special Summon 1 Level 4 or lower "Six Samurai" monster from your hand. While you control another face-up "Six Samurai" monster with a different name, this c.. If you control a face-up "Legendary Six Samurai - Mizuho", you can Special Summon this card from your hand. If this card is Tributed, select 1 "Six Samurai" monster in your Graveyard, and add it to yo.. If you control a face-up "Legendary Six Samurai - Shinai", you can Special Summon this card from your hand. Once per turn, you can Tribute another Six Samurai monster to select and destroy 1 card on t.. When (exactly) 1 face-up "Six Samurai" monster you control is targeted by a Spell Card, Trap Card, Spell/Trap effect, or Effect Monster's effect, you can change the target to this face-up card on the ..